Last week, I explained to you all the reasons why the Transformers is probably the most important fictional property of my life. 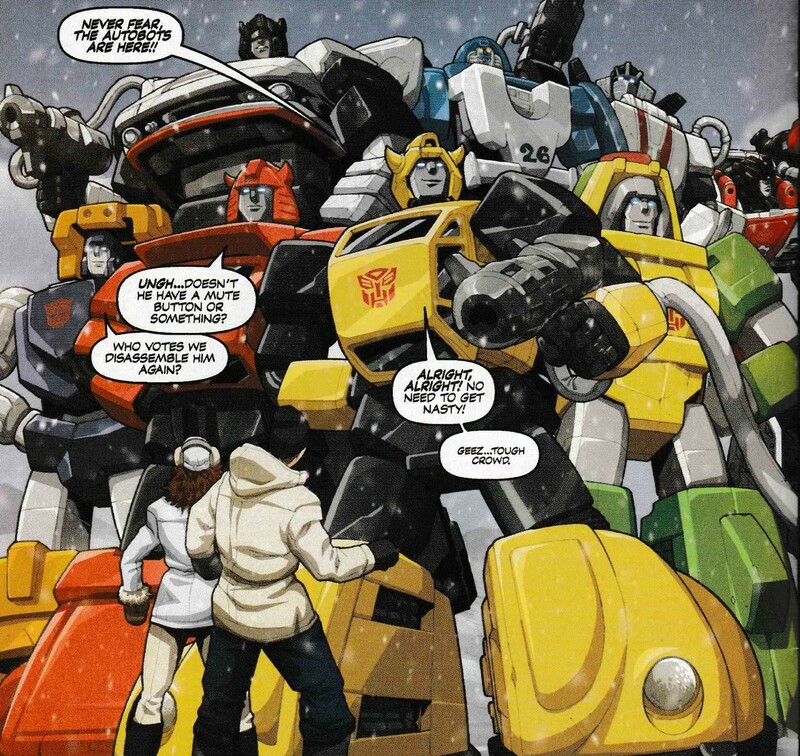 A big part of that were the comics produced by Dreamwave in the early part of the ‘00s. 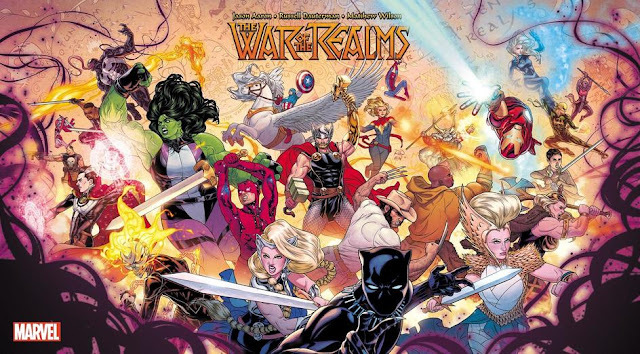 Comics which are destined to be lost and forgotten due to the company going out of business under controversial circumstances. Not willing to just let the tides of history dictate our cultural landscape, I have set upon a deeply personal journey, by doing a moderately competent job of covering those very comics that were so impactful upon a younger (and skinnier) me. It is the most noble of possible goals. General Hallo returns to the Pentagon with Spike as his prisoner, and orders all records of the bomb he dropped on the Transformers erased. At the location of the bomb site, a hard metal shell shaped like the bomb’s burst pattern stands. 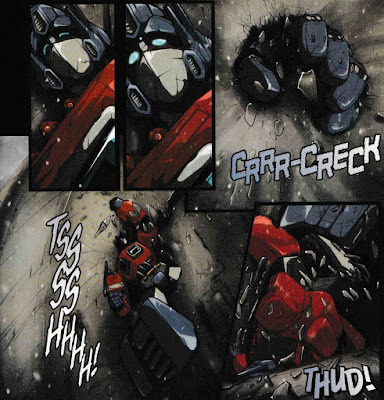 Optimus Prime breaks through the wall of the shell and climbs outside. The Autobots that are still operational help pull their brothers from the structure. 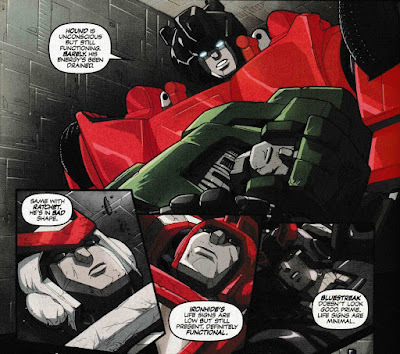 Wheeljack marvels at how Megatron’s metallic virus feeds off of energy, including firepower. Optimus warns them to stay on guard for the Decepticons, but they have already fled the scene. Deep in the Pacific Ocean, a submarine is hit and destroyed by something very very big. Optimus and the Autobots make their way to Lazarus’s home base, where they find Soundwave’s original machine used to create the virus. They also find their missing comrades, most of whom are in bad to worse shape. The original machine no longer matters, the virus has already evolved and begun fueling itself. With that problem already on the table, a barely functioning Ironhide summons up the strength to relay a message Megatron had left for Optimus Prime. 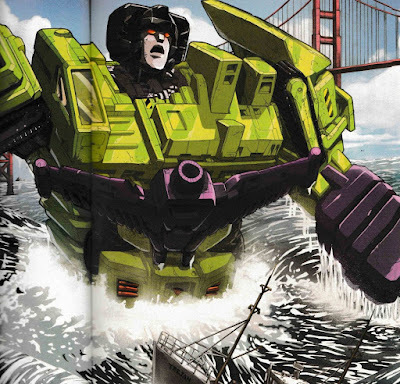 Megatron and the Decepticons launch a full scale assault on the city (San Francisco, I assume). Grimlock and the others tear into the city. 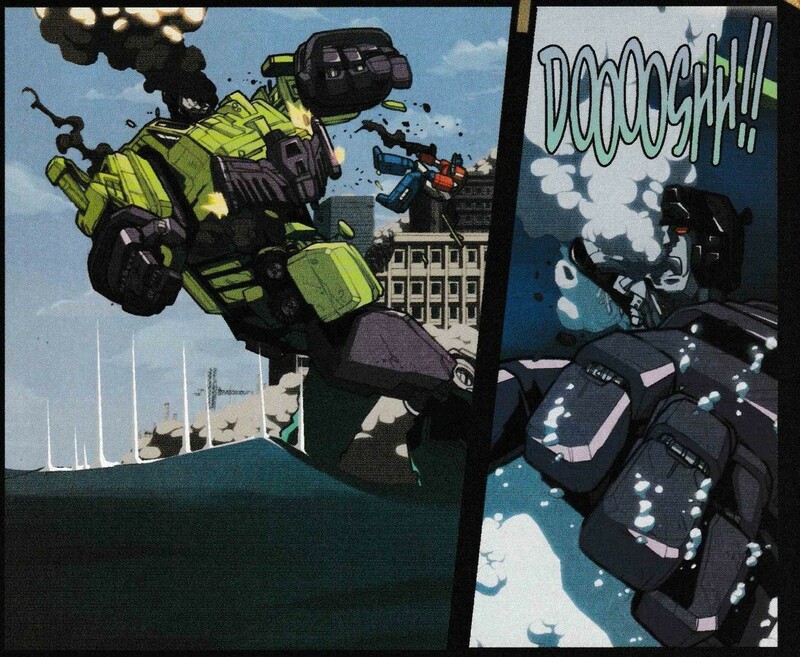 Devastator reaches for a couple cowering with a small child, but Superion arrives just in time to save them. Optimus and the other Autobots have also arrived to try and stop the Decepticons. Starscream and the other seekers fire on Superion, forcing him to break apart into the individual Aerialbots. Back in the arctic, Wheeljack works as fast as he can to try and find a way to stop the metallic virus, while Jazz and the others try to repair the damaged Autobots. As I said before, Pat Lee was put on this Earth specifically to draw high octane Transformers action. His robots don’t look stiff or rigid like pin-ups. They move. A couple humans are enjoying their trip into the frozen woodlands, when they run into a revived Bumblebee and friends. Wheeljack was able to rig up some blasters that will counteract the metallic virus. 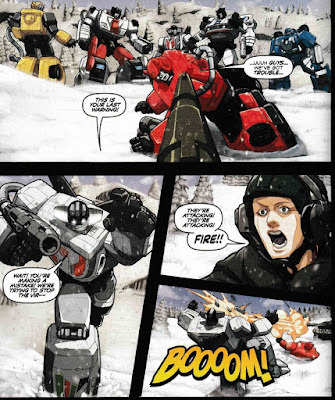 Unfortunately, the blasters operate off the Autobots personal power source, so each soldier runs the risk of killing themselves to stop the virus. Not a single Autobot hesitates to fire up their blaster. In San Francisco, Devastator is making short work of the overmatched Autobots. Only Optimus Prime remains, all alone against the mighty Decepticon combiner. 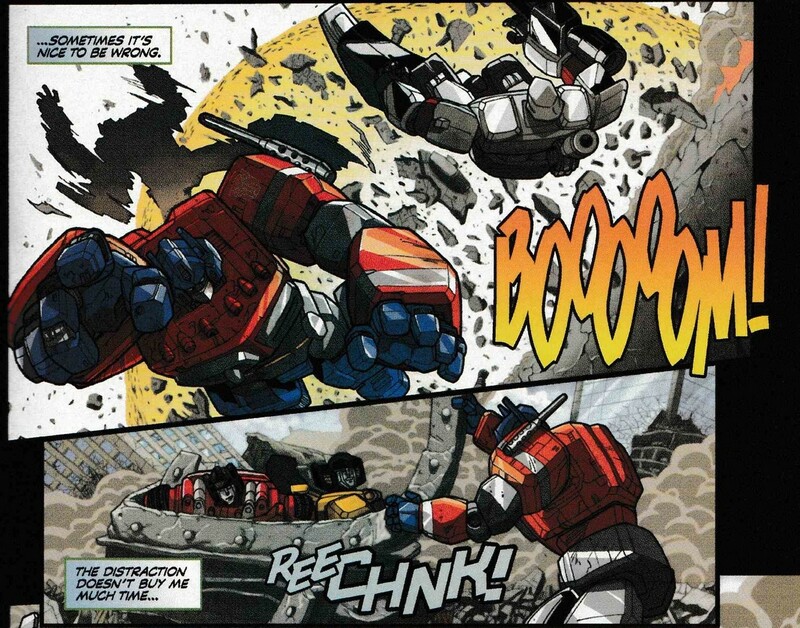 Optimus does not falter, and fells the giant robot with one gun blast to the face. Spike waits in his cell for 3 o’clock to come. A key card swipes the door, and it opens revealing someone that Spike recognizes. He is wheeled out by the strange janitor that gave him the warning about Hallo before. He shows him a Top Secret file he had hidden, named the Lazarus Project. Five years ago, General Hallo had commissioned an engineer named Adam Rook to create transforming robots for the DWT. He couldn’t pull it off, so they changed their plans into coming up with a way to control the Transformers instead. It wasn’t really a viable option, until the Autobots finally defeated the Decepticons. 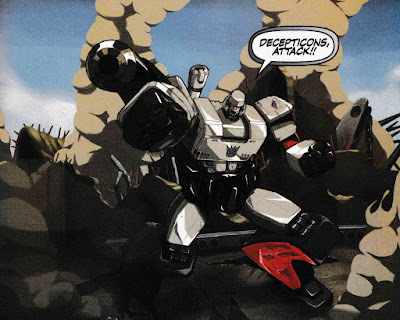 Unknown to anyone, Hallo and Rook worked on the deactivated Decepticons, and perfected their program for controlling Transformers. They couldn’t risk the Autobots finding out, so the Ark II and all its inhabitants were destroyed, with it made to look like an accident. The janitor’s brother had worked on the project, but wanted out when he learned of the plans to blow up the Ark. He made copies of the file and gave it to his brother, but it cost him his life. Rook also wanted out, so he disappeared, taking the control technology with him. 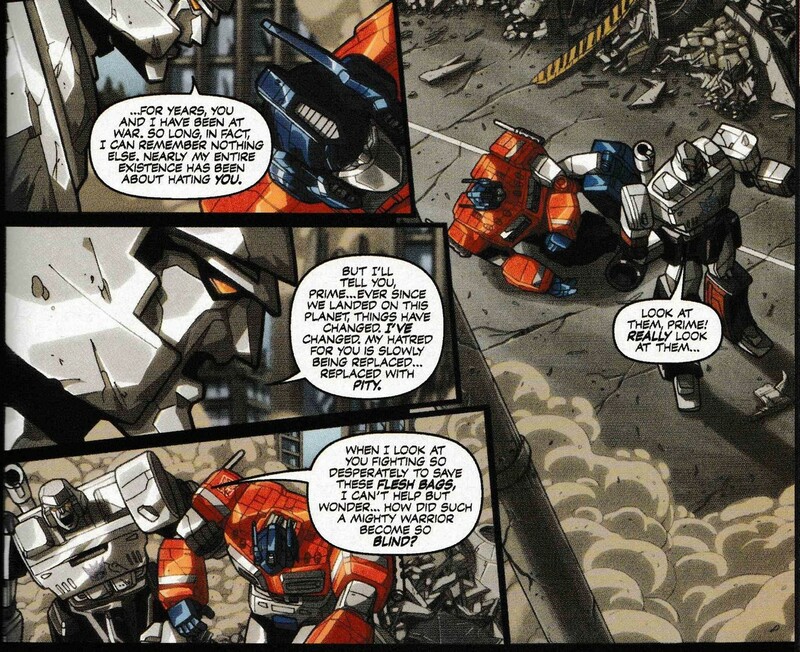 Megatron tries to convince Prime that his compassion for the humans is misplaced. They look around at the devastation, and see humans looting stores, leaving their fellow humans in danger to save themselves, and reporters covering the chaos without helping anyone. As cruel as Prime believes Megatron to be, Megatron believe the humans are even worse. They are not worthy of his efforts. Sadly, I have to side with Megatron here, for the most part. Humans are the worst. The never-ending popularity of the Kardashians is reason enough to justify our complete extinction as a species. At DWT headquarters, General Hallo prepares for his final endgame, authorizing a nuclear launch on San Francisco and the Transformers. There always has to be some crazy human that makes even the Decepticons look good. Damn military industrial complex. The President arrives at the Pentagon and is briefed on the response plans for the Transformer battle in San Francisco. Both he and the defense minister are shocked to learn that nuclear procedures have been initiated at their Pacific launch site, an act unauthorized by them. But it’s too late, the missile is already away. Wheeljack and the Autobots try to explain to the Canadian military what they’re doing, but the Canadians open fire on them when they mistake their actions for an attack. The Autobots try to avoid their fire, all while the virus continues to spread. Optimus Prime has had enough of Megatron’s rambling. 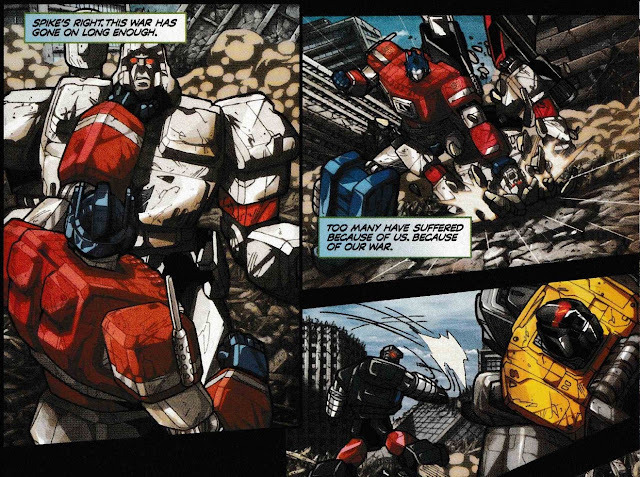 Optimus tells them to look around again, only this time they see the few humans helping each other, the emergency teams working to treat the injured, and the fire department trying to contain the blaze. It’s for those few among the many that he fights, even when those he once trusted abandon his side (shot fired, Grimlock). On cue, a fireman sends his fire truck careening off the bridge and into the Decepticons, causing an explosion and giving Optimus a long enough distraction to free the recovered Autobots. At the Pentagon, Spike confronts Hallo with the Lazarus Project file. But Hallo is too far gone to care, and pulls a gun on Spike. 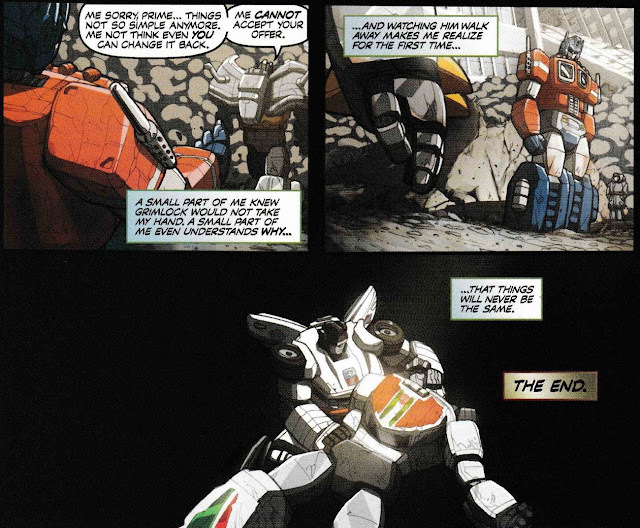 Wheeljack has one final desperate gamble, and runs off to implement it. The President and his men arrive at DWT headquarters to find Hallo holding Spike at gunpoint. Hallo makes a move at the gunmen, and is filled full of bullets and killed. The Autobots finish mopping up the Decepticons, when Optimus detects the nuclear missile launched at them on his internal radar. 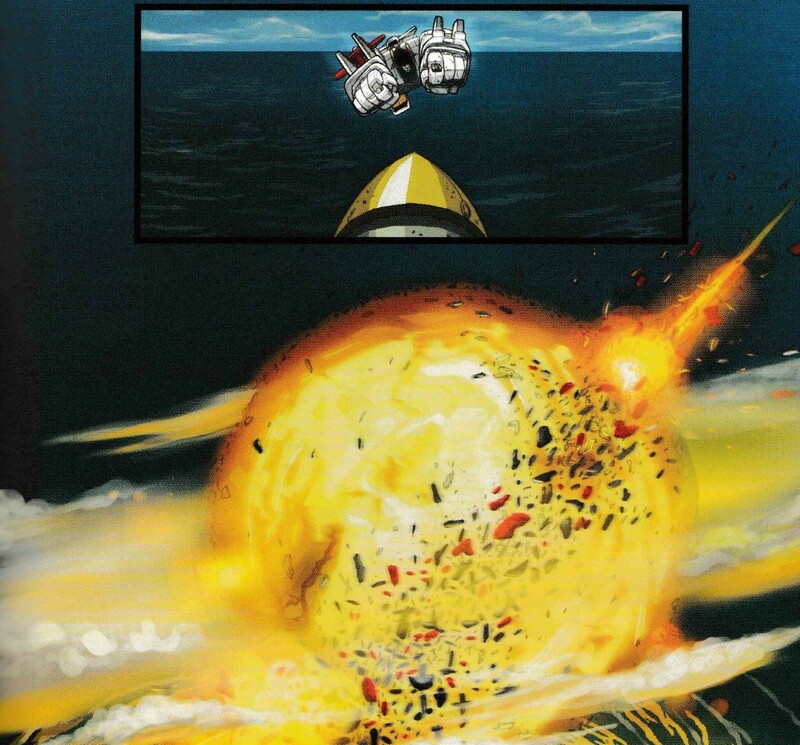 Superion meets the nuclear missile head on, destroying it and himself in the process. The resulting explosion creates a tidal wave that washes over the Pacific coast. 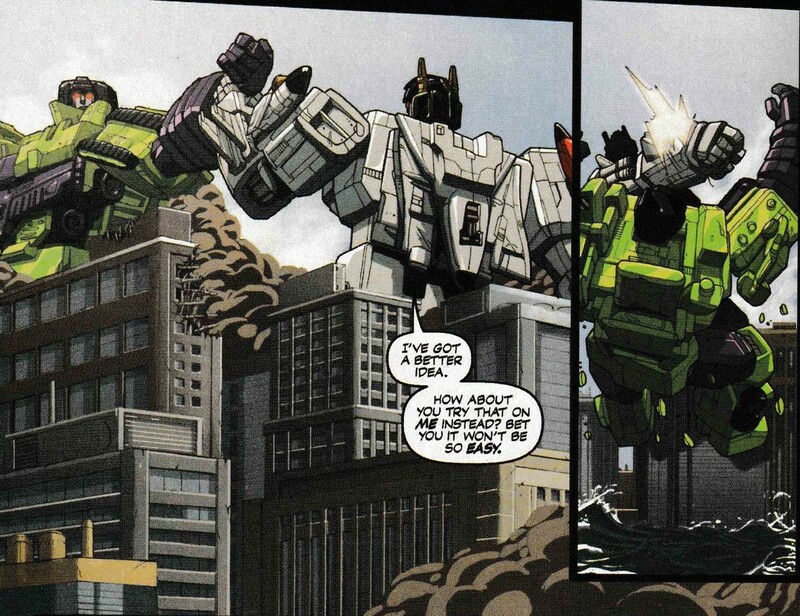 Wheeljack plugs himself into a nearby satellite, and uses all of his remaining power to destroy the metallic virus. 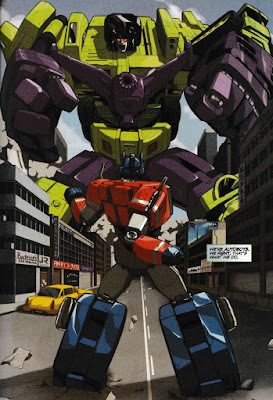 Meanwhile, Optimus Prime comes back online, and finds Spike standing over him (apparently Optimus was out long enough for Spike to commandeer a cross-country flight). They did it, Superion stopped the nuclear missile, saving millions of innocent lives, but the Decepticons escaped in the aftermath. 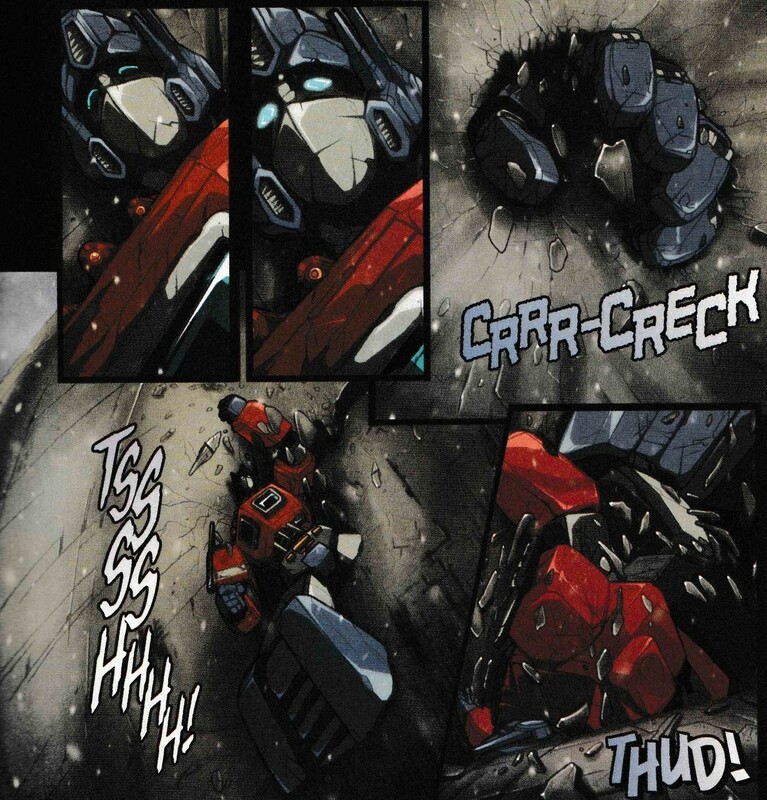 Optimus extends a hand to Grimlock, who was left behind by his new traitorous allies. Humans all around them angrily protest the return of the Transformers and their war. 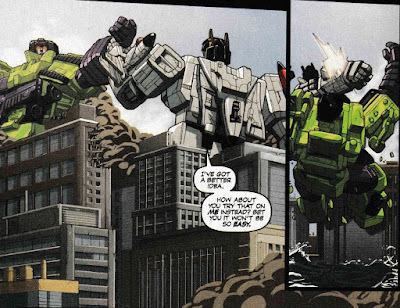 Grimlock declines Optimus Prime’s outstretched hand, not knowing what lays next for him. Optimus Prime looks around, and knows that things will never be the same again. That concludes Dreamwave’s Transformers, Volume 1. I think you will agree with me that it was a fun, action-packed story that was beautifully illustrated. If you didn’t, there’s really no help for you. Next week, probably more Transformers.